Join us during the “A Walk To Remember” Campaign for 2018. This is the ONLY fundraiser for Terrific Tuesdays, and this year’s goal is $10,000. If you don’t know what Terrific Tuesdays is I will tell you. It is a program that happens EVERY TUESDAY from 9:00 am – 2:00 pm. It is held at the First United Methodist Church in Sulphur Springs. It is a respite program for the Caregivers of participants with Alzheimer’s or other Brain Injuries. Terrific Tuesdays gives the Caregivers some much needed time off to just relax or run errands that they can’t do while they are taking care of their Love Ones who are affected by this horrible disease. The Participants are paired One on One with Loving and Caring Volunteers who stay with that person for the entire day. They keep them busy all day with games, puzzles, crafts, group activities, music, special events and lunch. This program is very special and is much needed in our community. 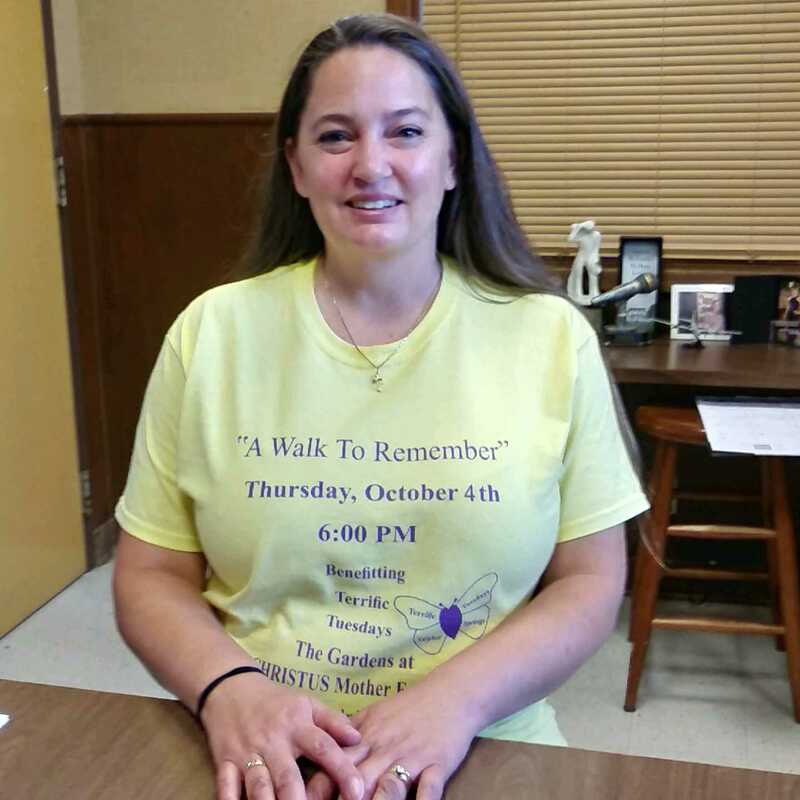 The way we raise funds for Terrific Tuesday is by holding a walk on the first Thursday in October. 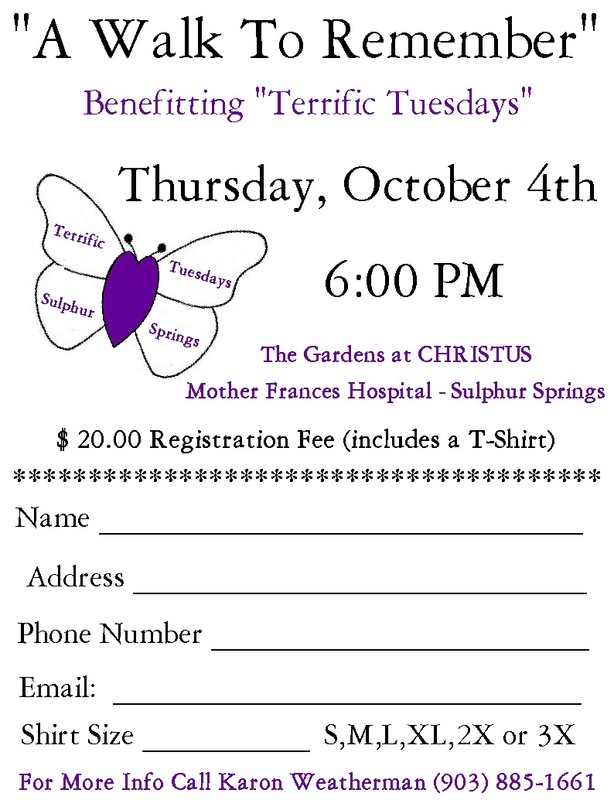 The walk is held in the Gardens at CHRISTUS Mother Frances Hospital – Sulphur Springs. We also have Mini Walks at all of the Nursing Homes and Assisted Living Facilities for the Seniors who are unable to attend the BIG WALK. We give a “Spirit Award” to the Facility that raises the most money. They have bragging rights and they get their name on a Perpetual Plaque that will hang in their Facility all year long. Below is the schedule of Mini Walks. You can attend one or all of them. The more the merrier! If you don’t want to walk but would like to Sponsor a walker or a few walkers, you can do that by making a donation to Terrific Tuesdays by coming by the Senior Citizens Center or mailing in a donation to the Senior Citizens Center at 150 Martin Luther King Blvd Sulphur Springs, Texas 75482. Make sure you make the check payable to Terrific Tuesdays.